Jan Jacob loves a beautiful, stylish ambiance. The first introduction meeting with retail architect Rick Blankenstijn of WSB was very pleasant. Rick Blankenstijn fully realised the trust he received from the Jacob family after completing the shop renovation. The collaboration between Jacob Juwelen and WSB is characterised by mutual trust and respect. The presentations in the shop window invite you to come shopping. The new store front looks robust and accessible. The shop window displays are deliberately made from floating elements with light, warm wood shades. The shop gives ample opportunity to serve the customer standing up. Alternatively, the lounge seating corner has a great ambiance, enhanced by an open fire place. The floors are made of stone with some mosaics. The counter tops are very detailed. The design of the details is repeated in the showcase displays and the lounge corner. But the animal hides used throughout may be the most eye-catching detail. The workshop was ingenuously integrated in the store. 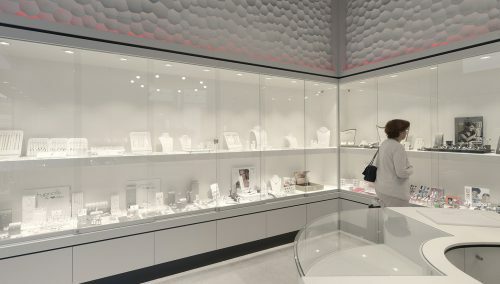 Jacob Jewellery is a professional store for jewellery, rings, watches and designer jewellery, and offers extensive experience as a gold smith. If you have restyling plans for your shop, please invite WSB’s retail architects for an inspiring brainstorm session! +31 277 17 14. 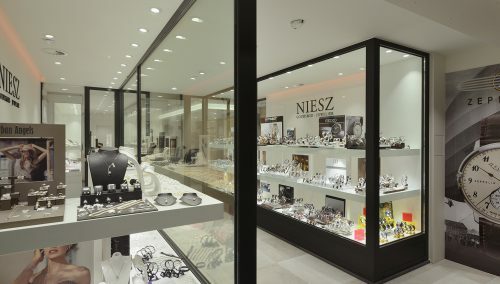 Click here for more jewellery shop designs. The response to the shop is so positive! 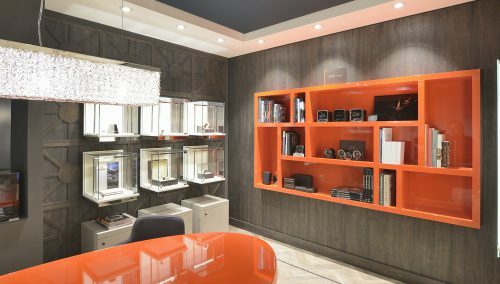 I hear from representatives left and right that we have one of the most beautiful shops in Belgium… That really makes us proud! Thank you for the fantastic design!